WASHINGTON, D.C. -- While notable majorities of all other political party/ideology groups say the effects of global warming will happen within their lifetime, fewer than four in 10 conservative Republicans (37%) agree, a sign of that political identity's strident skepticism on this issue. Conservative Republicans not only decisively reject the notion that the effects of global warming will happen in this lifetime -- a position in sharp contrast to all other political identities -- but another 40% say global warming will never happen. This is significantly higher than the percentages of moderate/liberal Republicans (16%), non-leaning independents (14%), conservative/moderate Democrats (5%) and liberal Democrats (3%) who say the same. These results are based on an aggregate of more than 6,000 interviews conducted as part of Gallup's annual Environment poll each March from 2010 to 2015. Both party affiliation and ideological association are self-reported. The party definitions take into account both respondents' initial party preference -- as Democratic, Republican or independent -- and independents' leanings toward either party, which are ascertained in a follow-up question. Therefore, the group of "Republicans" reported here includes Republican identifiers and Republican-leaning independents. "Democrats" includes Democratic identifiers and Democratic-leaning independents, and "non-leaning independents" are the residual independents who do not lean toward either major party. Global warming views are marked by a large partisan gap; Republicans typically treat the concept and consequences of global warming with a heavy dose of skepticism, while Democrats usually express concern about global warming's impact on the environment. To a lesser but still significant extent, Americans describing their political ideology as "conservative" -- regardless of party affiliation -- tend to cast doubt on global warming and its effects, while ideological moderates and especially liberals are more apt to see the matter as a serious challenge for society. It is at the intersection of these two key components of one's political identity -- party affiliation and ideology -- where the sharpest fissures in this debate occur. Gallup has fielded a set of questions designed to measure the public's understanding, skepticism and concern about global warming, and reviewing these data by political identity reveals that for some questions a particular political identity -- in this instance, conservative Republicans -- is driving the disagreement rather than the entire political party. Policymakers fiercely contest whether global warming is principally due to human-produced pollution or to natural changes in the environment. Of the major political identities, conservative Republicans are the only group in which a clear majority (70%) attribute increasing terrestrial temperatures to natural changes in the environment. 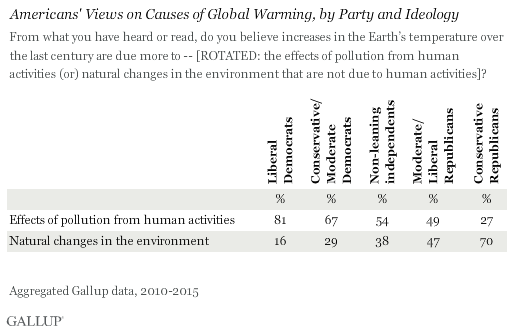 By contrast, majorities of Democrats and independents say global warming is due to effects of pollution from human activities. Moderate/liberal Republicans are split on the issue. Earlier this year, the Senate failed to pass a proposal that would have officially recognized human pollution as a cause of global warming; two of the three announced Republican presidential primary candidates -- Ted Cruz and Marco Rubio -- voted against the measure. Rand Paul was alone among the "official" GOP candidates in supporting the proposal. Similar dynamics are revealed on another Gallup question, but in an opposite direction. 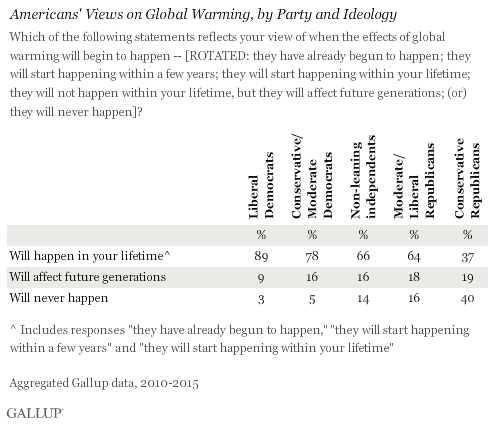 Nearly six in 10 liberal Democrats (58%) assess global warming as a serious threat to their way of life, a judgment not reflected in any of the alternate political identities. Less than half of conservative/moderate Democrats (46%), 35% of independents, 30% of moderate/liberal Republicans and 12% of conservative Republicans agree with this viewpoint. In this instance, then, it is the other "extreme" political identity -- liberal Democrats rather than conservative Republicans -- whose views diverge with the mainstream opinions of the other political identities. President Barack Obama will visit the Florida Everglades on Earth Day to discuss the threats posed to the planet by global warming, which is almost certain to draw both criticism and acclaim. But despite the political volley match, Americans have, for the last several years, reported a consistent viewpoint on this topic: A majority believe the effects of global warming have already begun to happen, and blame human activity for increases in the Earth's temperature. This stable consensus belies the sharp political divisions that have paralyzed the national government's ability to grapple with this issue, at least in a way that both Congress and the president approve of. While Obama may pursue international accords aimed at combating greenhouse gases, the Republican Congress unabashedly opposes these endeavors. In what amounts to a perfect summation of the distance between the two parties, Obama recently identified global warming as the biggest threat to future generations, while the Republican Chair of the Senate Environment and Public Works Committee, James Inhofe, has previously called global warming a "hoax." Inhofe, considered by the National Journal as one of the most conservative U.S. senators, undoubtedly represents an extreme viewpoint, just as Obama's heightened language may not accurately capture how many Americans interpret the consequences of global warming. But even as the viewpoints of Obama and Inhofe -- and politicians of a similar ideological profile to either of these two men -- might seem irreconcilable, there appears to be evidence that many Americans agree on issues related to global warming, even if a consensus is not found at the extremes of the American political/ideological spectrum. Results for this Gallup poll are based on telephone interviews conducted in March of each year from 2010 to 2015, with an aggregated random sample of 6,154 adults, aged 18 and older, living in all 50 U.S. states and the District of Columbia. For results based on the total sample of national adults, the margin of sampling error is ±1 percentage point at the 95% confidence level. For results based on the total sample of 1,073 liberal Democrats, the margin of sampling error is ±4 percentage points at the 95% confidence level. For results based on the total sample of 1,536 moderate/conservative Democrats, the margin of sampling error is ±3 percentage points at the 95% confidence level. For results based on the total sample of 916 moderate/liberal Republicans, the margin of sampling error is ±4 percentage points at the 95% confidence level. For results based on the total sample of 1,877 conservative Republicans, the margin of sampling error is ±3 percentage points at the 95% confidence level. All reported margins of sampling error include computed design effects for weighting. For Republicans, having more education increases skepticism of global warming, rather than decreases it. For Democrats, the opposite is true.